Today KS2 had a visit from SafetyNet to learn the correct ways to be safe online. We discussed what to do if something goes wrong, cyber bullying and what is safe to use. Year 5 & 6 then had a workshop to discuss in more detail how to 'Stay Safe Online'. It was lovely to see the children ask so many useful questions! It is really important that everyone knows how to stay safe online. Using the Internet sensibly is something that St Joseph's encourages all children to do. Please see below for useful websites for parent/carers. As part of Anti-Bullying week the KS2 pupils have all entered the competition. The winner will be announced early December and will feature in the SafetyNet calendar - Good luck everyone! This year’s theme for 'Anti-Bullying week’ was 'Respect' and on Tuesday, the school celebrated in an assembly all the great ways we show respect throughout the school. Miss Hill set the children a task to write a 'Kindness Catcher' for another pupil who was not in their class. Miss Morrison was inundated with 'Kindness Catchers' to read out by the end of the week! Mrs Cox also joined the assembly to teach the children five Makaton signs of love, friendship, kindness, beauty and respect. The children were set a challenge to sign these to teaching staff around the school and see if the staff could guess what they mean! As part of becoming a School of Sanctuary, our school has now begun a regular #CultureClub. As part of this, we are also celebrating a different language each month in each class across the school! We have been learning everything from Romanian, to Lithuanian, to Arabic, to Polish to Urdu! We are so excited about our diverse school and love learning all we can about the cultures that are so central to all of it. Thank you to all the student teachers who have made it possible! As part of our social education, we learned about Down's Syndrome and raised money to support the cause of raising awareness and supporting children in education. Below you can see what we did across the school to make it happen. Year 4 managed to raise the most money and did a range of activities to raise awareness. They did 21 maths exercises and 21 physical exercises in 21 minutes! Their exercises were sponsored and we are so grateful for the families that got around them to sponsor them! Well done Year 4! Year 5 brought in items to sell from home. They gave up their Golden Time to set up and sell items. They also hid cards around school that could be traded in for prizes to raise interest and awareness. Well done Year 5! Year 6 brought in money to donate and wore pyjamas. They also raised money through selling items after school - well done Year 6! At St Joseph's, we are delighted to be celebrating Grandparents' Week again this year. It has become a highlight in our calendar and is thoroughly enjoyed by pupils, staff and grandparents. On Monday, grandparents (and honorary grandparents) were invited into school for a special assembly and to spend time with their grandchildren and their friends sharing books in the library. Throughout the week, grandparents have been welcomed into classes for a range of activities. St Andrew's and St Elizabeth's grandparents playing board games and hand-printing. We had a fundraising family breakfast and were overwhelmed by the amount of support. Over £300 was raised which was split between MacMillan cancer support and Dementia Awareness. It was lovely to get together as a school family and catch up over a cup of tea and a bacon butty! Click on the picture to read the B&H PSHE Program of Study. This is what we base our PSHE teaching on. We teach our PSHE in half termly units covering whole school themes. See a PPT showing our RSE coverage here. Every year we plan for a multi-cultural week at St Joseph's. We are very lucky that, at St Joseph's, we are a school rich in diversity- we have pupils from many different backgrounds, faiths and beliefs. We recognise that this diversity is a huge strength of our school and something that should be celebrated. "Language is a gift" was another important part of our multicultural week's learning this year. Each class based their learning/research around one country/culture of a pupil in the class. Learning some key phrases and greetings in that language formed part of this work. Year 1 learning about Zimbabwe with Nolly and Andre's parents. During this week we hosted a coffee morning celebrating, "language is a gift," in which parents, carers, family members and friends were invited in for a coffee morning. 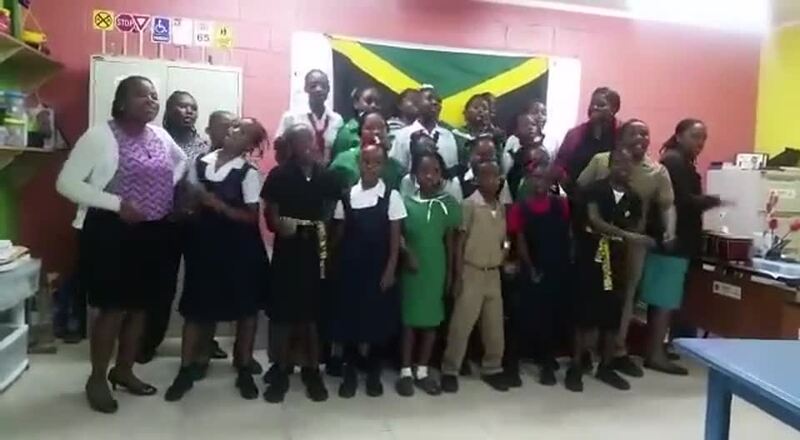 As you may have heard from your child, last year we made a link with a primary school in Jamaica called Bryce School. The school is located centrally in the Jamaican mountains. It has many similarities, as well as many differences, to St Joseph's and we are beginning to find out more about each other through letter writing (the school has no phones or internet). The School Council met recently to form a questionnaire which has been sent to the pupils at Bryce School and we are eagerly awaiting a response from them. In the meantime, one of the teachers at the school managed to get herself some internet service in the local town and sent us a video. In the video the children are asking questions about our school and pupils. UPDATE ..... Thank you to everyone who donated books to send to Bryce School. These were sent in July and arrived safely in Jamaica in October after a very long journey! The children and staff were thrilled to receive them. At St Joseph's, we are really keen to help our friends in Jamaica. We try to fund-raise for them whenever possible and support them in any way we can. Over the last year we have had two very successful Caribbean Evenings to raise money for the Bryce School. Our most recent event was on Friday 19th May 2017 and £420 was raised to buy much-needed resources for our friends in Jamaica. The staff and pupils at the Bryce School are so grateful for the support from St Joseph's, that they sent us a special message for our Caribbean night - a song. Click on the video below to hear it. Please click on the Bryce School link to see more about our fundraising events and links to the Bryce School in Jamaica on our FOSJ's page. At St Josephs, we know that life can sometimes be tricky and that it can make us all feel sad, lonely, worried, nervous, as well as lots of other emotions. It is OK to be worried about things, and sometimes talking about a worry helps. In each class we have a worry box which has been decorated by the children. Our pupils know they can use the worry box to share any problems or worries that might be bothering them. The boxes are checked daily and the children are reassured to know that an adult will find time to talk to them about their worry that day, if they wish to discuss it. In our early years class, the children made a set of worry dolls.